Home > Uncategorized > Spring Cleaning? Don’t Forget Bookmans! Every year spring brings pastel and earth tones, fresh breezes, flowers, birds chirping our way. Life is good, isn’t it? Of course, once we turn away from the Disney splendor of it all and take a look at our own house, we quickly realize that we may have overdone it this past year. Adding new items to your home can be a thrill, but there comes a time when we need to take stock of our things and reevaluate their place in your home. And so begins the annual spring cleaning! Cleaning and organizing your house can be a major buzzkill, but don’t fear – Bookmans is here to help! If you are anything like me, extreme cleaning is something you try to get away with doing only a few times a year. But spring cleaning doesn’t have to be as arduous as you might be imagining it to be. And I’m here to reassure you that Bookmans won’t leave you hanging when it comes to unloading the things you no longer want cluttering up your house. While cleaning, you might come across items like DVDs or VHS player, housewares that haven’t seen the sun in years, an old gaming console and games that no one’s playing, and jewelry that you never wear. You’re probably wondering “what am I going to do with all this stuff now?” This is where Bookmans can help you out BIG TIME! Bookmans has always been the community’s go-to to buy, sell, and trade! Simply bring in the items you no longer want in your home, including books, magazines, comics, music, movies, video games, musical instruments, electronics, and housewares. While you shop and hang out, we will sort through your items and select we want to trade with you. Soon enough, you’ll get an offer from Bookmans for trade credit and cash. 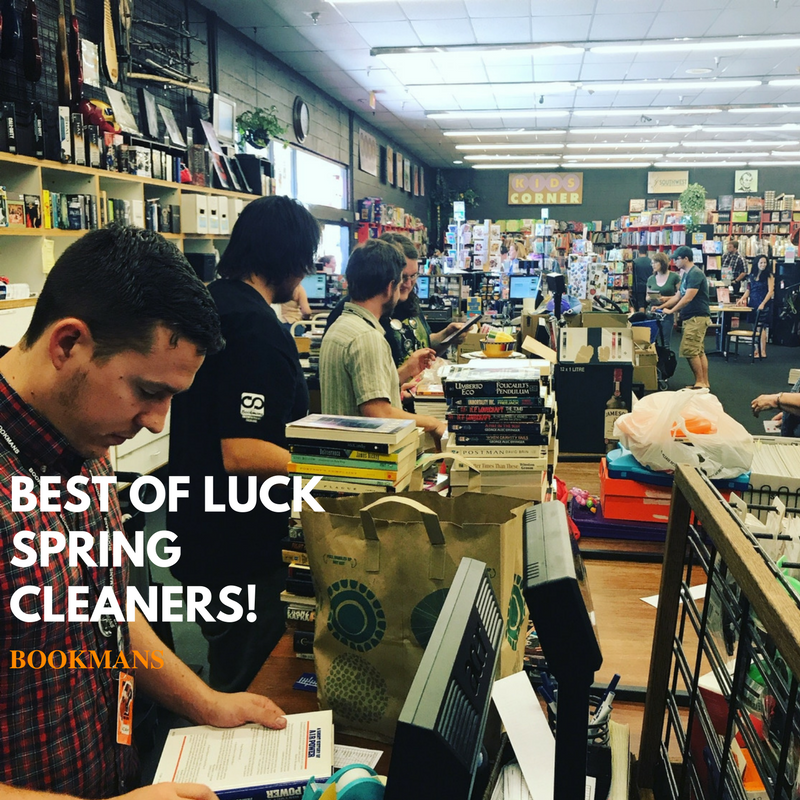 Spring cleaning is a tricky task, but it can be made easier with the support of your nearest Bookmans location. Find out which store is closest to you on our store page, then get to cleaning. You’ll be overjoyed with all of that new clean space at home and room to spare for all of the cool new stuff you can purchase with your trade credit. Best of luck, spring cleaners! For more info on how to trade, head to our Buy, Sell, Trade page.